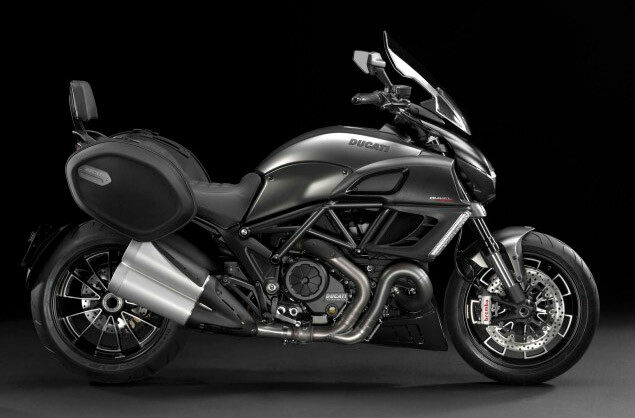 The exuberance of the Diavel meets maximum comfort. Innovative solutions and dedicated accessories - side bags, windshield, new seat and raised handlebars - make the Diavel Strada ideal to dominate the asphalt on the open road. 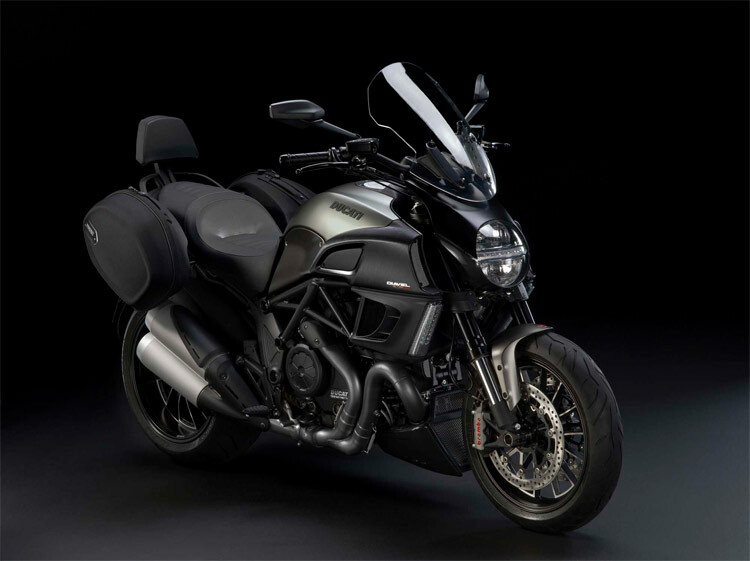 The Strada makes for a practical new addition to the Diavel family. Contact us today to book a test ride and find out our latest special offers on Ducati Diavel. The Diavel rolls on stunning, custom 14-spoke wheels with machine-finished detailing. The front rim is 3.5x17, while the rear, which is “flow-formed” for enhanced structure and lightness, boasts a massive 8x17 rim. The Diavel have a Sachs rear suspension unit slung low under the chassis in a horizontal position, operated by a progressive pull-rod linkage from the swingarm. Adjustable in compression and rebound damping, the unit uses a handy control for easy spring pre-load adjustment. 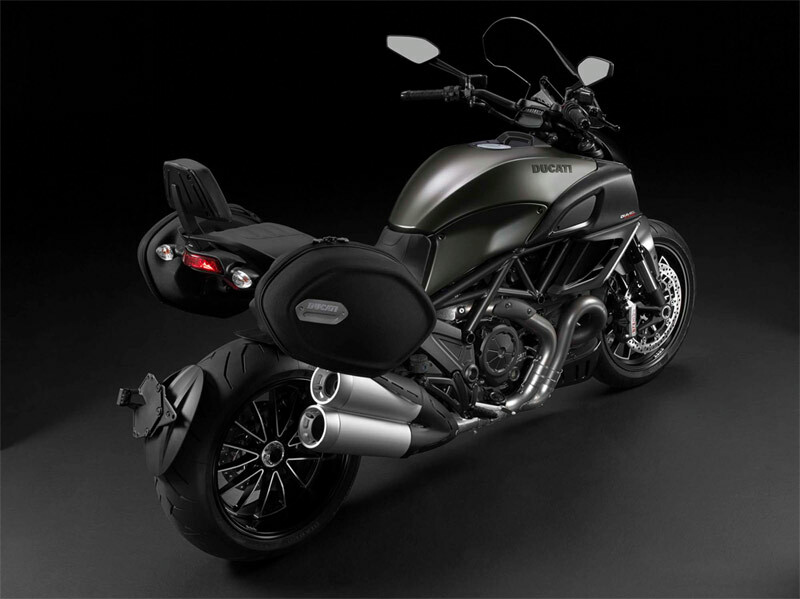 The Diavel Strada shows off its Touring soul sporting two 41-litre side panniers with a dynamic-looking style. The luggage system includes integrated grab rails for the passenger to share his riding passion with a passenger. The tourer character of the Diavel Strada is enhanced by details designed to improve the travel experience of rider and passenger. Heated grips improve comfort in adverse weather conditions, whereas new fixed pillion rider footpegs, luggage system with integrated grab rails and dedicated backrest increase stability and passenger comfort. The new, broader touring windscreen blends seamlessly into the aggressive silhouette of the Diavel Strada and affords excellent wind protection, offering an enhanced feeling of comfort. Comfort is brought to the next level by new ergonomics based on the dedicated tourer seat and the 20-mm higher handlebar that ensures total, relaxed control for superior riding pleasure. The two-level tourer seat with high-density foam padding fitted to the Diavel Strada offers improved ergonomics and comfort for rider and passenger over long journeys. Weight distribution has been revised to keep the rider farther away from the tank for better fit and a comfortable riding position that provides total control of the bike. Passenger comfort is further enhanced by the dedicated backrest - fitted as standard - that also helps keep passenger weight off the rider's back. Technical data referring to power and torque was measured on an engine test stand at Ducati. CLUTCH Light action, wet, multiplate clutch with hydraulic control. Self-servo action on drive, slipper action on over-run. INSTRUMENTATION Handlebar mounted instrumentation with LCD display: speed, rpm, time, coolant temp. Warning lights for: Neutral, turn signals, high-beam, rev-limit, DTC intervention, ABS status, oil pressure, fuel reserve. Tank mounted instrumentation with TFT colour display: gear selected, air temp, battery voltage, trips 1 & 2, fuel reserve trip, average and actual fuel consumption and speed, trip time, scheduled maintenance. Full status and/or management of Riding Modes, DTC, RbW and ABS. Ducati guarantees all its bikes for a period of 24 months from registration, with unlimited mileage. 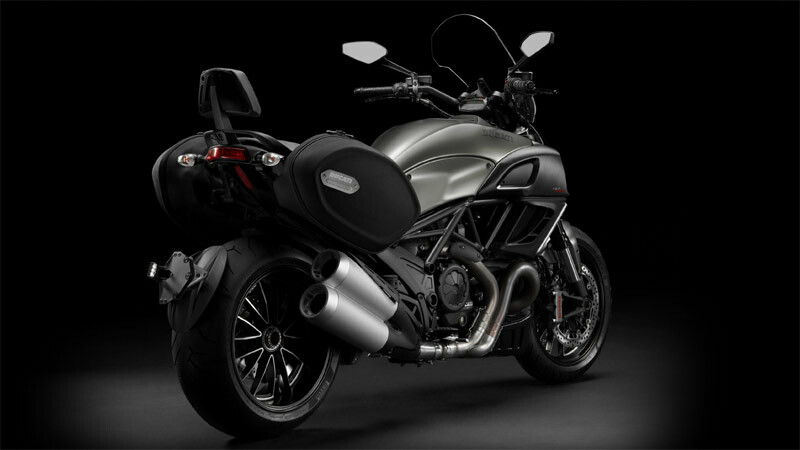 We offer a range of affordable finance options on new & used Diavel Strada motorcycles. Top prices paid for all Ducati motorcycles. Quick & Easy - No Hassle or Gimmicks. Parts and Accessories designed specifically for your Diavel.